Friday night, we made this and we both curled up on the couch after a long week. I thought about suggesting we go “Lady and the Tramp” with the linguine, but then I realized that would mean sharing my noodles so I quickly nixed that idea. 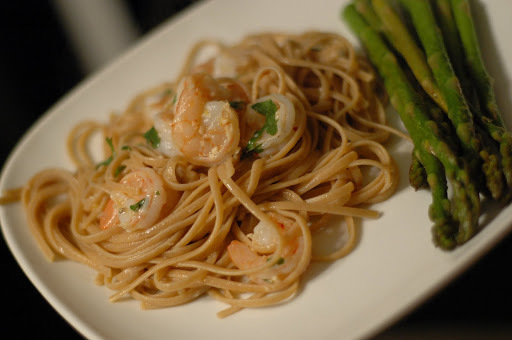 I made a few small changes to Ina’s original recipe and served sauteed asparagus on the side. This meal takes 30 minutes to make, but it looks very elegant. Meanwhile, in another large (12-inch), heavy-bottomed pan, melt the butter and olive oil over medium-low heat. Add the garlic. Saute for 1 minute. Be careful, the garlic burns easily! Add the shrimp, 1 1/2 teaspoons of salt, and the pepper and saute until the shrimp have just turned pink, about 5 minutes, stirring often. Remove from the heat, add the parsley, lemon zest, lemon juice and red pepper flakes. Toss to combine. p.s. I’m finally getting the hang of our new camera lens-the fixed 50 mm. And I am loving it!!! I’m certainly no photographer, but the colors and lighting are a million times better with this lens. Hopefully, I’ll keep learning more!